Are you trying to cut down on carbs and eat more veggies? Zucchini noodles are a healthier, low carb, gluten-free alternative to pasta. To make zucchini noodles you can use a spiral slicer, a mandolin or a julienne peeler. Slice the zucchini just until you reach the seeds. A few seeds won’t matter, but you don’t want it to be too seedy or the noodles will fall apart. I used a spiral slicer like this one (this is not an affiliate link). Just a couple of quick turns and in less than a minute you will have a plate of zoodles ( zucchini + noodles=zoodles). If you use a mandolin, please be careful as the blades are very sharp. Place the zoodles in a colander, toss them with a bit of salt and let them sit for 15 minutes. The salt will help reduce their moisture content so you don’t end up with soggy noodles. 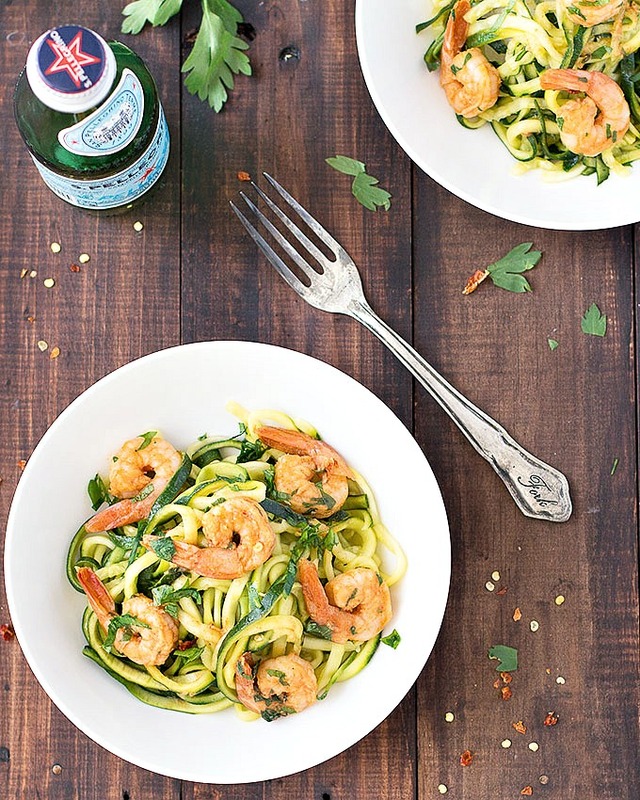 If you’ve never had zucchini noodles before, you’ve got to try them! 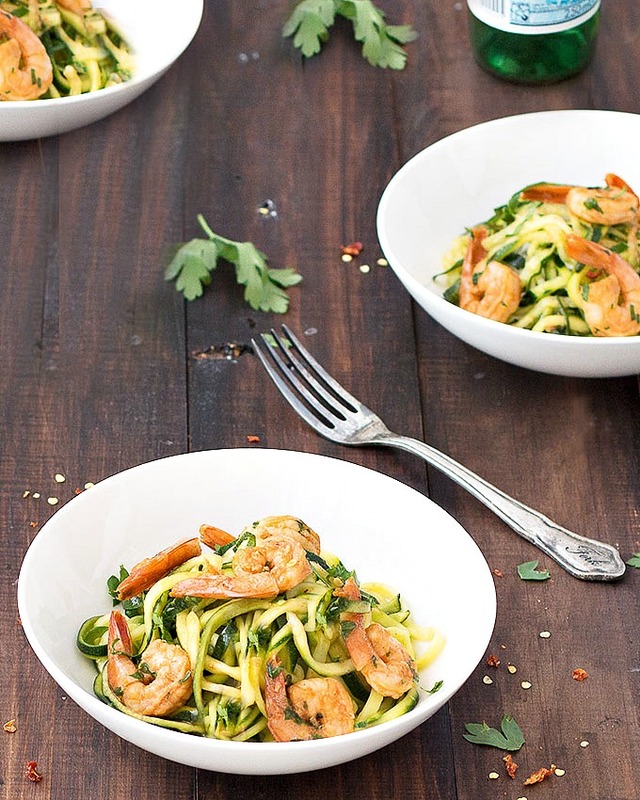 Zucchini noodles with garlic shrimp: an easy, healthy, low carb, gluten free meal that takes only 20 minutes to throw together. 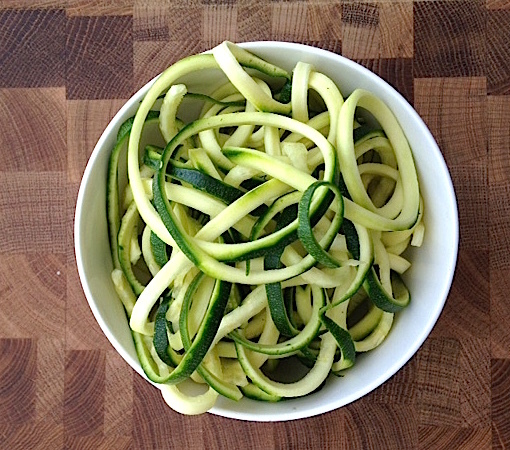 Using a spiral slicer, cut the zucchini into noodles and place them into a colander over a bowl or in the sink. Sprinkle the zucchini with salt and toss to combine. Let the zucchini sit for 15 minutes while the salt extracts the moisture. Meanwhile, combine garlic, paprika, chili flakes,lemon juice, and shrimp in a bowl and mix well. Heat the olive oil in a large skillet over medium high heat. When the pan is hot, add the shrimp and season with salt and pepper. Saute until the shrimp change color. Rinse the zucchini under running water to remove the salt and dry on paper towels. Add the zucchini noodles and parsley to the garlic shrimp, toss to coat and serve. 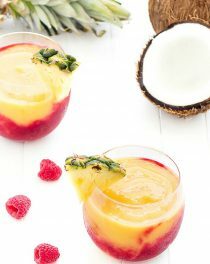 What a fun, yummy and healthy dish! Beautiful dish and pictures! Thanks for sharing. I have a spiraliser and the combination of courgette and shrimp is very tempting. I must try this! I LOVE Zucchini noodles and your recipe looks so good. 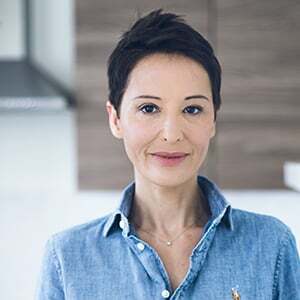 Elena, thanks so much for this great post! I’m always looking for ways to use zucchini at harvest time. Now i know how to make zoodles and use them in another fantastic zucchini recipe! Oh this looks so good! We had shrimp last night, and now I want more. I wish I had a spiralizer! Thanks for the recipe. I am DESPERATE for a spiraliser!! Your noodles look so, so tasty! This looks great and i really like the use of the zucchini noodles. I’m a huge fan of spiralising veggies, and this looks like a fabulously simple and flavour-packed midweek supper. Gorgeous styling, too. Pinning, SU etc. Yum! Just making sure . . . you don’t cook the “zoodles”? Made this today! Delicious. Sautéed shrimp first and remove from pan then put noodles in pan to stir and cook. Added cooked shrimp after about 5 minutes. Family LOVED it! I made this for myself tonight, It’s awesome!! I’ll be making this again! So I don’t like zucchini noodles but I did make the shrimp and I was very happy with the result. Probably shouldn’t admit this but since we’re all friends here I’ll be honest and tell you garlic is a staple of my diet. I once saw a young woman who was allergic to garlic… That didn’t last for a few reasons but I have to admit I was a little relieved I wouldn’t have to be super careful about not cooking anything with garlic six hours before I was going to hang out with her. That was how long it took to get it out of the air and off my breath. You might be surprised how many things have garlic in them. Anyway, I plan on throwing these together with some linguini or something in the near future and when I do I’ll let you know how it goes. Thanks for another great recipe, Elena! Loved this! I used a julienne peeler with green and yellow zucchini for some colour variation, and threw in a dozen halved grape tomatoes along with the zuchinni noodles and cooked about 2 minutes before finishing up with the parsley. Delicious! This was SO GOOD! I put it over a mound of mashed cauliflower and it was almost like shrimp and grits. It’s also point friendly for anyone on Weight Watchers. 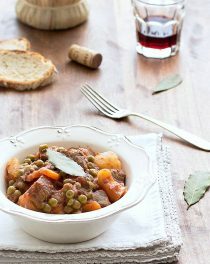 Ohh I love love love this recipe Elena. Beautifully done!! Awesome and simple I honestly thought it would lack flavour due to not being in a thick like sauce but I was wrong! Will be adding this to my recipe book. I am glad you liked it, Billie! Thank you for your feedback. Thanks for the recipe! Looks delicious! So are you just tossing the zucchini to make it warm or should it be sauteed? I just think they would be so crunchy if you didn’t cook them down. Hi Megan! They are not too crunchy. If you cook the zucchini for too long they will become soggy and release too much water. Fabulous! The only thing I did differently was removed the shrimp from the pan and added the zoodles to soak up the floor. It was really great. 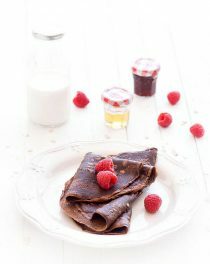 I never leave reviews but this recipe is super awesome especially if you are doing a carb free diet. Tasted awesome the only change I made was I added a roasted bell pepper. Super yummy thanks! This was delish! Thank you! Thank you so much for this recipes.It looks delicious.I really like this zucchini noodles with garlic shrimp.Beautiful dish and pictures.I will sharing your site to other users.